Professor Michael E. Porter, one of the world’s leading business scholars, welcomed LBS as a ‘rookie’ to the Microeconomics of Competitiveness (MOC) affiliate network. The MOC network includes more than 100 major business schools from 65 countries across the globe. 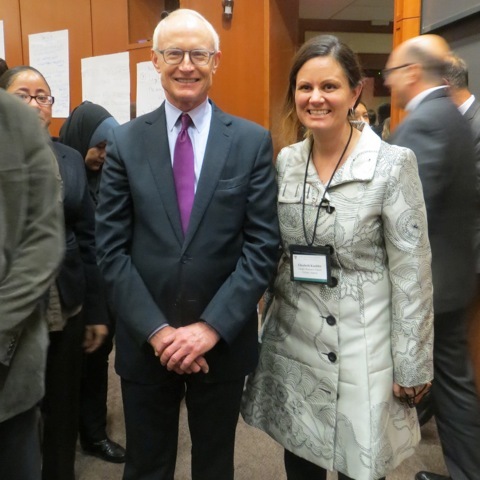 Based at Professor Porter’s Institute of Strategy & Competitiveness at Harvard Business School, the network promotes scholarship, research and capacity building on some of the key concepts of Michael Porter’s groundbreaking scholarship: strategy, competitiveness of firms and nations, economic prosperity, and the significance of clusters. LBS master students will see immediate benefit from the school’s participation in the MOC network. Every IML and BFC student will explore the impactful ideas of MOC, in courses taught by experienced MOC scholars and LBS faculty members Professor Pablo Collazzo and Professor Christopher Kummer. These intense courses are designed on the highly engaging case teaching method developed at Harvard Business School. LBS furthermore envisages to set up an Institute for Competitiveness on the school’s premises to bring together international experts and local decision-makers from the business and public sector. In December 2014 LBS faculty members as well as Head of International Relations Professor Elisabeth Kübler take part in the annual MOC faculty meeting at Harvard Business School, Boston, Massachusetts. The meeting encompasses inspiring lectures by Professor Porter and global leaders who put the idea of competitiveness into business and policy practice. Read more about the Harvard MOC activities at LBS.